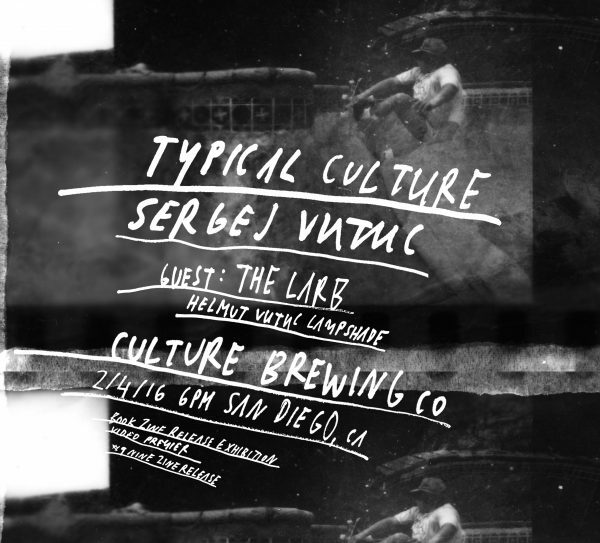 Our brothers in San Diego TYPICAL CULTURE have a zine release party with another confusion brother Sergej Vutuc releasing his book at the Culture Brewing Co. in SD this Thursday, the 4th, with THE LARB and Helmut Vutuc Lampshade for live musical entertainment. We’d say this is going to be a not to be missed event of radicalness. The Lost World a new Typical Culture Montage premiering Thursday 2/4/16 at Culture Brewing Co. Featuring: Brendan Keaveny, Chris Coogan, Ricky Holderby, Andy Mack, Chris LaRue, Connor Getzlaff, Drew Dezort, Rick Rossi, Michael Morris, Malky, Alan Young, Tyler Lee, James Martin, Julz Lynn, Tim Williams, Jordan Hoffart, and Tom Goodlad.